My friend Dagmar makes this awesome chicken curry frequently, and I've had it at her house. She has, however, moved across the country and our dinners will be less frequent, unfortunately. 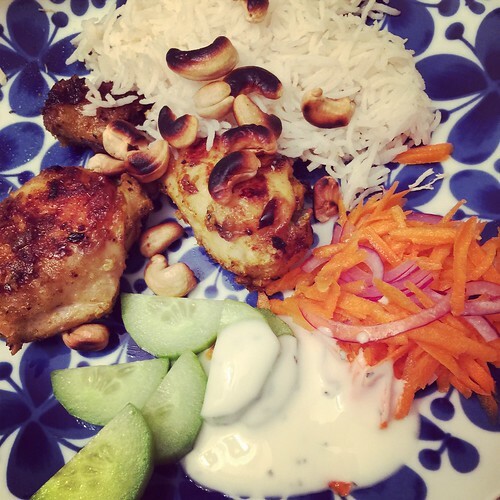 She does however make weekly menus and post to Instagram, and she gladly shares her recipes. So a few nights ago, we made her curry, and felt a little bit closer. This recipe marinates over night which I feel makes it perfect and very convenient - but you have to prepare. Season the chicken pieces with plenty of salt and pepper, toss with the lime juice (original uses lemon) and leave for 20 minutes. Stir together ginger, garlic, yogurt, and all the spices. (Not the oil or the onions.) Mix with the chicken and place in an oven-proof dish. Cover and refrigerate over night. When ready to cook, bring it up to room temperature. Brush with oil and top with the onions. Bake at 200°C for 30 minutes. Turn the chicken over and cook for another 30-40 minutes, basting with the juices as you go along. Serve with rice, a salad of grated carrots with lime and coriander, and some more yogurt.